The first phase of the LOINC2HPO project developed algorithms and software to integrate FHIR/LOINC encoded laboratory test results as HPO codes and performed a pilot analysis on an EHR dataset of 15,000 patients with asthma and related conditions. We will extend this work to other types of data including radiology, pathology, and freetext, and demonstrate data mining algorithms that exploit our mappings in new ways. The first phase of the LOINC2HPO project aimed to integrate FHIR/LOINC encoded laboratory test results as HPO codes. We created a SMART on FHIR app and performed a pilot study in which we showed that this approach can identify asthma biomarkers in EHR data. This work resulted in a demonstrable CD2H success and we submitted this manuscript. The first phase of the LOINC2HPO project aimed to encode FHIR/LOINC laboratory test results as HPO codes. 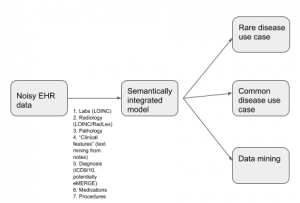 However, It would be advantageous to have all phenotypically relevant parts of the EHR in an integrated semantic model that would allow HPO-based computations or other extractions and would include other relevant phenotypic attributes such as imaging results, pathology results, and moving forward medications, procedures, etc. We will use MONDO and (nascent) computational models of common disease to enable analysis of this data in many ways. The work would be roughly similar to the LOINC work — develop tools and strategies for biocuration to record observations and test outcomes using HPO terms. This is obviously a large project, and as such, we propose to start with the radiology and pathology data. Medicine is noisy, and there are multiple levels of data cleansing, data interpretation, and inference in the medical process. In order to make the envisioned system maximally useful, we will want to model some parts of these processes algorithmically. The simplest example is that if we measure electrolytes 20 times in one patient, and one measurement shows a slightly increased sodium, do we want to infer that the HPO term for Hypernatremia should be used for downstream analysis? In our asthma pilot study, we required that a laboratory abnormality be observed at least three times to call the corresponding HPO term, but this is not a robust general approach.To address this issue, we will aim to characterize patterns of abnormalities in real EHR data, and develop strategies for “denoising” the primary data. Text-mining is being increasingly used to extract HPO terms from EHR data and to use it for genomic diagnostics (Kai Wang group in New York)  (also personal communication by several practitioners of genomic medicine at other institutions). It would be valuable to have a SMART on FHIR app that would extract HPO terms from various textual parts of the medical record, present them to the physician for “vetting”, and transmit them to genome analysis software (in form of a phenopacket). We propose to advance the software engineering of the SMART on FHIR app we developed in phase I to accommodate this new functionality.. The work on the “semantically integrated model” as per above, is important for choosing the right combination of HPO terms for the genomic diagnostics. Finally, the current generation of HPO algorithms works best with modest numbers of characteristic HPO terms (e.g., 7), but we will be able to extract up to over 100 HPO terms from HPO data (personal communication). Also, we will be able to extract negated HPO terms (e.g., not Abnormal sodium concentration). Optimally, we will extend current HPO-based algorithms to deal with high numbers of HPO terms, including high numbers of negated terms. Making the correct diagnosis in common disease can be as challenging as in rare disease, even though there are numerous presentations such as acute myocardial infarction that are familiar to nearly all physicians. Asking questions about the underlying cause of new complications in patients with multimorbid past medical histories is challenging and is not well addressed by any current algorithm we are aware of. Here, we propose to begin to develop data structures and algorithms to represent common disease phenotypes using the “semantically integrated model” as input into the this new generation of algorithms. This will be a preliminary exploration but will be important to validate and develop the semantically integrated model. A phenotype-driven approach opens up entirely new ways of mining EHR data for correlations that might be important in understanding disease pathophysiology, gender or age-differences, and biomarkers. It is important to develop clever ways of analyzing the data. We expect that many phenotype abnormalities might be highly correlated in all disease states, and thus identifying such an “obvious” correlation would not be an interesting result. For instance, Abnormal hematocrit and Abnormal hemoglobin level are expected to be highly correlated. Here, wee propose adapting the approach taken to characterize synergy networks in expression data , which was developed to find gene-gene interactions that are specifically associated with a phenotype (such as a particular cancer). The method is based on an information theoretic analysis of multivariate synergy that decomposes sets of genes into submodules each of which contains synergistically interacting gene . The method can be extended to phenotype to search for pairs of markers (HPO terms) that show mutual information conditional upon the presence of a specific diagnosis (e.g., an ICD9 code, or possible an eMERGE classification). The result would be a data driven way of defining pairs of features that show a surprising correlation in the presence of a disease — this might lead to the discovery of potential biomarkers (in this case, if one finds some HPO term in a person with some disease, then “synergy” would suggest the other HPO term of the pair would be more likely to be present than expected by chance). We also believe this might be a good opportunity to engage CTSA hubs in data exploration or the use of this approach/resulting derived data for DREAM challenges. Son JH, Xie G, Yuan C, Ena L, Li Z, Goldstein A, et al. Deep Phenotyping on Electronic Health Records Facilitates Genetic Diagnosis by Clinical Exomes. Am J Hum Genet. 2018;103:58–73. Watkinson J, Wang X, Zheng T, Anastassiou D. Identification of gene interactions associated with disease from gene expression data using synergy networks. BMC Syst Biol. 2008;2:10. Anastassiou D. Computational analysis of the synergy among multiple interacting genes. Mol Syst Biol. 2007;3:83.